A few weeks ago I spent four days in Singapore. I ran 7-8km each day, yet still put on 3kg. Most of that extra padding can be directly linked to the amount of hawker food I ate. What follows are some thoughts about the experience. The post is in two parts: a general summary, followed by more detailed comments about specific dishes and venues. It’s much longer than a typical Rocket and Squash piece, but is hopefully still interesting, and may even be useful for anyone thinking of visiting or stopping over. Singapore is a melting pot. A melting pot of religion and culture. A fascinating blend of immigrants who, together, make up a relatively young nation. Barely a fishing village of around 1000 people when the East India Company moved in in 1819, Singapore grew as a trading outpost, shipping port and finance hub on the back of Chinese and Malay and later Indian and Eurasion workers, eventually gaining independence from the British in 1963 and then Malaysia in 1965. Its population is now around 5.5 million, 40% of whom are foreign workers. There appears to be one thing that binds the potentially disparate population, bringing them together as proud Singaporeans: food. Indeed eating is a national pastime. Probably the national pastime. And why not? With such a rich and diverse food heritage across the immigrant groups, it is no surprise that Singapore offers authentic Chinese (in all its variants), Malay, Indonesian and Indian food, but also different cuisines born of racial fusion (in particular the superb Peranakan Nyonya food), as well as uniquely Singaporean dishes which, through many, many examples, blend the country’s components together. If you speak to a Singaporean, all of this food is the food of their country; in that sense ‘Singaporean cuisine’ is racially blind. Most of that food can be found in ‘Hawker Centres’. 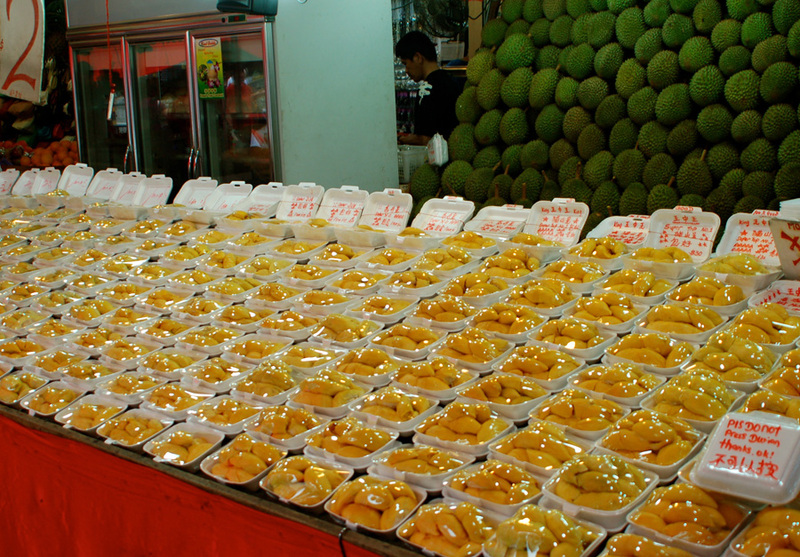 There are 107 official centres, which together comprise well over 100,000 individual hawker stands, each selling a few specialty dishes, generally for just a few dollars. When you think about it, that’s quite remarkable number of food stalls for a country much smaller in size and population than Greater London. The centres were conceived, built and filled in the ‘70s and ‘80s as part of the famed sanitisation of Singapore. 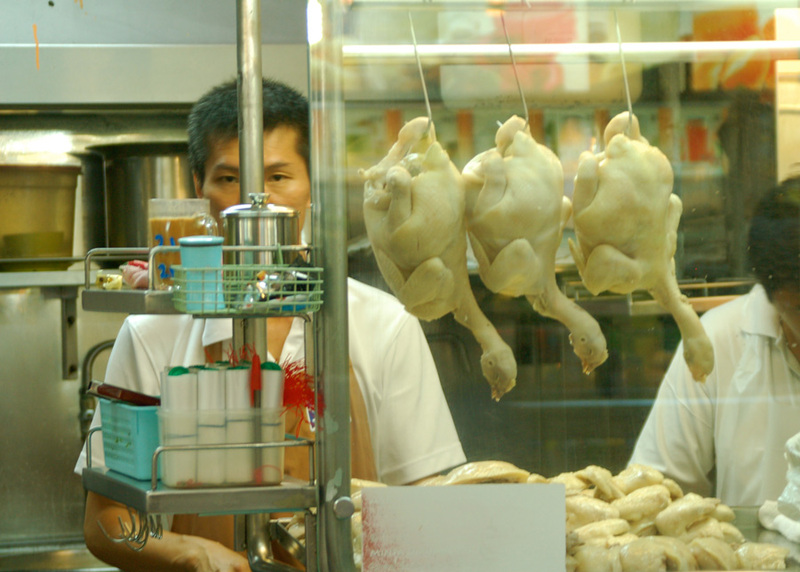 Immigrant street food traders – hawkers – were moved indoors, given access to power, water and waste disposal, effectively creating extremely convenient spaces for Singaporeans to come together and eat home-style food very cheaply. In all honesty, my first two hawker centre experiences were disappointing. The covered sites reeked of the ’80s and appeared identikit and soulless in comparison to fledgling trucks, street carts and stalls and curated food events in West Coast America and London; many of the traditional dishes I’d been excited about were over-sweet, one note, and little more than basic fast food; I found none of the innovative food, full of fresh, new flavours that I’d been hoping for; it was acutely apparent that the government is rightly worried that the majority of hawkers are an ageing work-force, whose children and grandchildren prefer to seek white-collar careers. Crumbs, I had thought that Singapore was the capital of ‘street food’. The reality appeared bleak. There’s much to be written on the topic of Singapore hawker culture and its future and also on its relevance to the current Western street food boom. But that’s not for now. 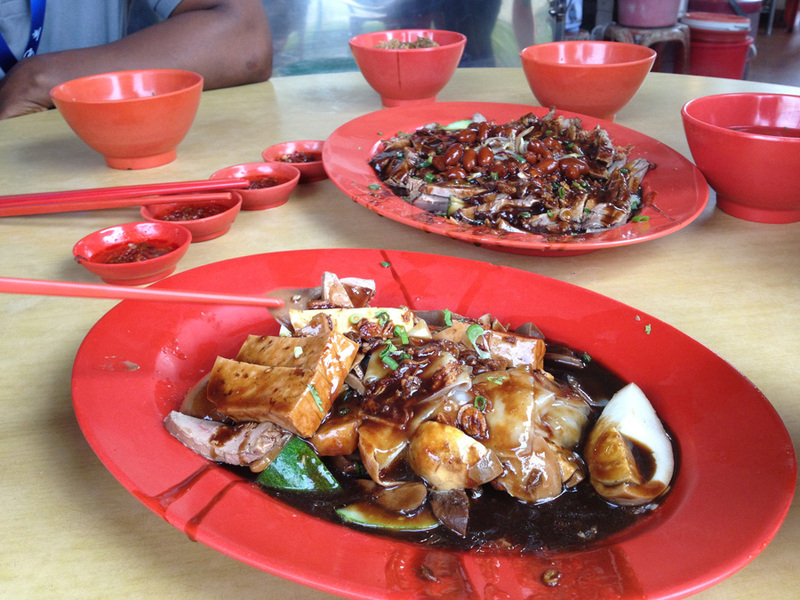 Suffice to say, though, that my experience of hawker food changed throughout the trip. By the end, I was a total convert lah. Appreciating that hawker food is not street food as we Londoners know it, and that that is fine, was a turning point. Grasping the fact that the romantic view of eating outside doesn’t work during the day in a place as hot and humid as Singapore was also significant; the covered hawker centres and their fans are a necessity. Importantly, in the second half of the trip I was guided and prompted and advised by locals. Which meant I began to experience the best of what’s out there. For whilst you can eat pretty badly, you can also eat incredibly well. I started to see first hand the sheer diversity of dishes, and that hawkers – or specifically, good hawkers – provides every Singaporean with access to convenient and cheap food, cooked to order with skill and experience. But maybe the most significant thing was the passion that every Singaporean exudes for hawker food. Ask a group of locals to recommend their favourite stall or centre and, once they’ve argued at supersonic pace amongst themselves, they’ll each insist that they drop everything and drag you around the city. That’s pretty endearing. So, in short, if you’re in or thinking of Singapore as a food destination, find a local friend to take you round. Failing that, my thoughts and experiences of various dishes and hawker centres are written below and might help you form some sort of eating plan. Consider trying some the dishes I mention – like sambal stingray, oyster omelettes and chicken rice – but don’t constrain yourself to them. Be experimental in an informed way, by asking locals and following queues. Tian-Tian’s Hainanese chicken rice. Pale, poached chicken and rice doesn’t sound or, frankly, look particularly exciting or tasty. But this is a national dish and the highly regarded Tian-Tian appears to be an excellent place to try it out. The chicken pieces are succulent and the rice cooked in chicken stock and then dripped with more meaty juices. I was converted. Zhen-Zhen’s Yusheng Chinese sashimi. Lightly cured saito fish, limes, coriander, shredded lettuce, chilli and caramelised onions makes for an atypically fresh and zingy dish. These guys also had a massive queue for their porridge meals. 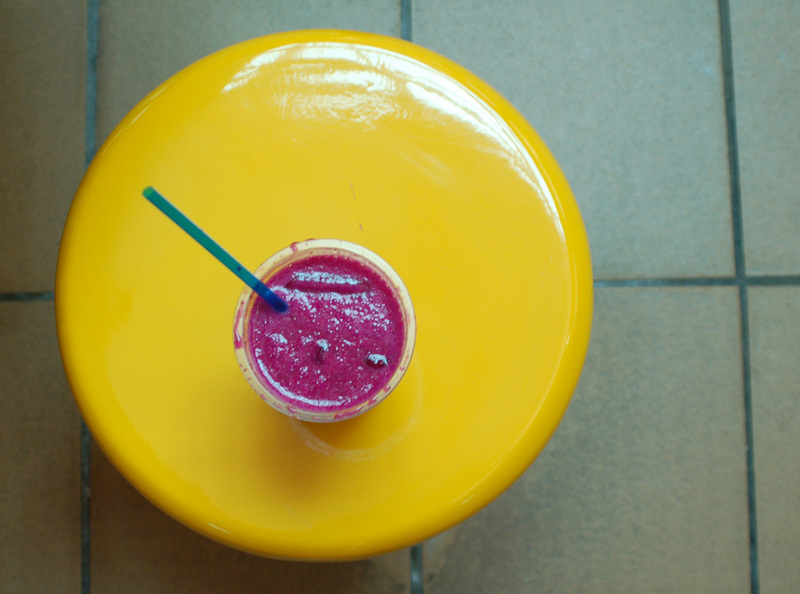 Dragon fruit drink. I wasn’t enamoured by brightly coloured syrup based bubbletea hawker stalls, but there were a few fresh juice stalls that proved delicious (see also Old Airport Road below). A juice stall a few places to the left of Zhen-Zhen (as you face it) blitzed up a striking pink dragon fruit and orange blend. Squid and pork balls. Pretty much opposite the juice place was a stall titled ‘Teochew Sutong and Pork Balls’. Did what it said on the tin: minced squid (sutong) and pork balls in simple but delicious stock. Apparently many hawkers buy in the balls these days to save costs and time. The lady here makes them by hand but will give up as soon as her kids are through uni; her recipe and craft will probably disappear with her. Many Singaporeans have suggested to me that this is the place to go for the best representation of a non-touristed hawker centre with many ‘must try’ stalls. By and large, I was disappointed. I don’t want to totally write it off though (as I did Maxwell Road before a return visit), not least because it was absolutely rammed on the lunchtime that we went. That must mean something, right? A fresh juice stall was my highlight (see below). Xin Mei Xiang Zheng. This stall selling bowls of special fried fish and noodles in a rich brown stock had the biggest queue I saw at any centre. Sadly, what came from it was a fairly bland, MSG ridden dish. Thick brown gloop pervaded everything. Even picking out the fish from its soggy batter provided little joy. Bee Hoon (stall 1-120). More fried fish and another long queue. We tried Bee Hoon soup and Bee Hoon noodles. Both came in a cloudy white milky stock. The noodle version was bland. The soup much better, with more ingredients giving much more depth. Hougang Otah. This might not have been the best example of Otah – fish paste steamed in banana leaves – but I still enjoyed the spicy crab version that I tried from this stall. I’d eat lots of Otah if I lived in Singapore or Malaysia. Have a look at Shu Han’s recipe for mackerel ones here. Meilock Soursop juice bar. Lots of freshly squeezed exotic fruit juices on offer. The ‘Kelonglong (Umbra) and sour plum juice’ contained two items I’d never had before and said ‘must try’ next to it. I loved it. Stall 46’s steamed Gong Gong (sea snails). A plate of perfectly steamed cockles on steroids, plucked from the shell with a cocktail stick and dipped in a tingling black pepper, lime and chilli dip, will be a food memory that stays long in the memory. Stall 36’s oyster omelette. Small but plump oysters. In a sort of omelette. Sweet, mineral, sloppy, salty. Shouldn’t work but it did. 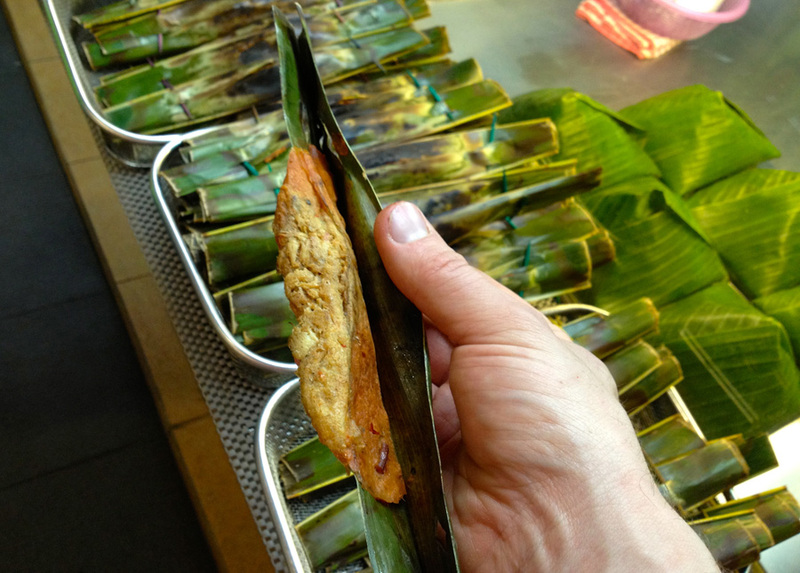 Stingray, smothered in Sambal and barbecued in a banana leaf. Sorry, I don’t recall the particular stall, but this was offered by at least 1/4 of the 50 odd places in the centre. Awesome dish. Cereal prawns. Again, can’t remember where these were from, and it may have been the effect of cold beer, but prawns, still in their shells but coated with a particular type of breakfast oat, then deep-fried were ridiculously moreish. Probably the most interesting and characterful covered hawker centre that I experienced, Lau Pa Sat sits beneath the shiny towers of the city’s financial district in the site of an old ‘wet’ market. I didn’t eat from the inner stalls, but there’s a lot on offer – all types of cuisines and plenty of offal, if that’s your thing. In the evening, one of the streets on the edge of the market houses a number of satay huts and food carts. 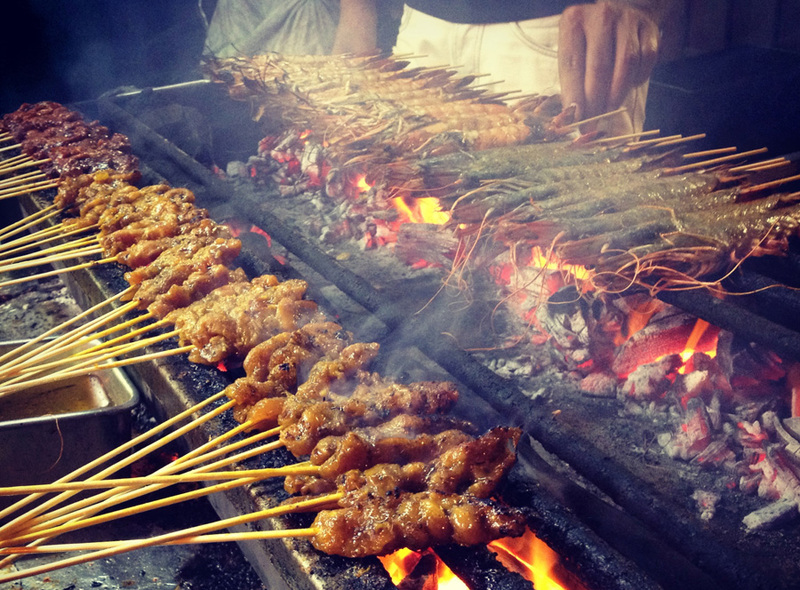 Tons of satay sticks, theatrically grilled over hot charcoal, cold beer in jugs, other street food options on tap and seats under the stars. It was enough to make a few gnarled Western street food fans go all blurry eyed. On the beach in the East, this is the most idyllic of the hawker centres I saw (if you ignore the many container ships lined up a stones throw away). Despite its location and though it’s outdoor, the main reasons for your visit should be because you’re headed to Roxy Laksa. Which served the most refined of all the hawker food I ate in Singapore, not to mention the best laksa I’ve ever had. A few other suggestions are listed below. Roxy Laksa. The laksa stock had more depth and complexity to any of the other stocks and sauces I’d sampled over five days. Huge dry shrimp and coconut flavours, but sweet too, and with a long but not abrasive chilli heat. 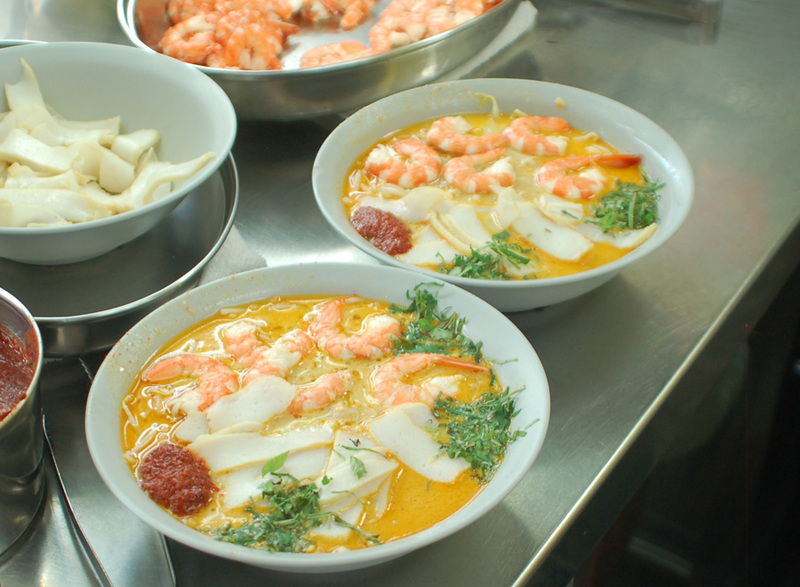 I particularly enjoyed watching the chef in his sparkling kitchen as he soaked and drained each bowl of noodles with the laksa sauce three times, before finally ladelling in a portion of sauce, adding thin strips of shrimp cake, shelled prawns and Vietnamese mint. A highlight. The stall next door sells freshly pressed sugar cane and lime juice. Refreshing. Han Jia Bak Kut Teh. This place, a few more stalls down from Roxy, served an insanely sticky looking pork knuckle dish. Curry puffs are good at East Coast Lagoon, apparently. Good example of Singapore’s fusion of immigrants (Indians are a significant minority + British Colonial Cornish pasty heritage). Maxwell Road (above) sits on the edge of Chinatown. But Chinatown has its own multi-storied complex and on some evenings food in the street too. I chanced upon two particular stalls that interested me: the first an example of a traditional and highly successful stand doing one thing and one thing well; the second, a glimmer of the kind of modern entrepreneurship that may take hawker centres forward. Head upstairs and towards the back of the section closest to Smith Street. Yang Ji 194 garlic steamed fish head. Tables and tables of friends and families were sitting down and feasting on large plates of steamed fish heads and kai lag and kang kong (steamed green vegetables). Later research found this is apparently one of the best places to find the dish. Craft beer. WTF? Next to Yang Ji, a stall with Brewdog on tap and more British and American craft beers in the fridge than the most hipster of pubs and bars in East London. 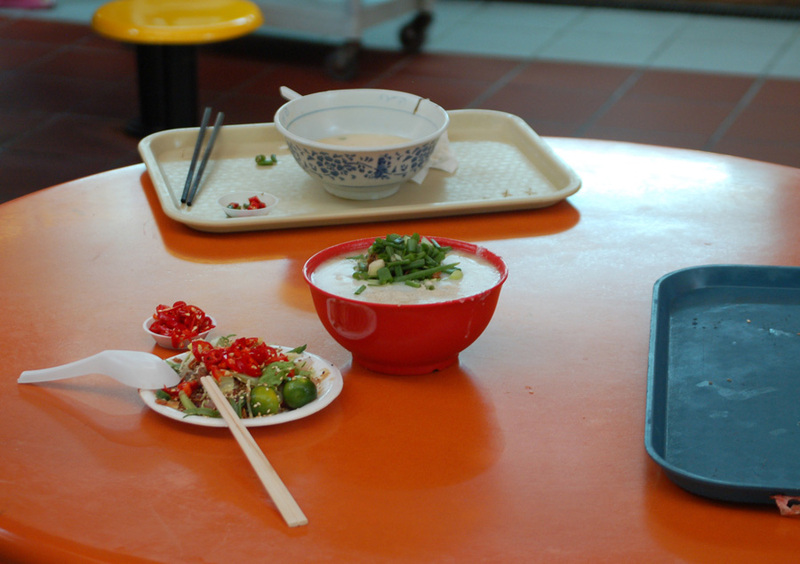 A sad Westernisation of Singaporean food culture? I don’t think so. It’s a bit of forward and outward thinking from new generation hawkers – for whom a captive market and relatively cheap hawker centre rent can allow for quick growth. There’s Asian craft beer too – Jungle appear to make various beers wheat beers and pale ales, and someone else pushes out flavoured beers using fruits such as lychee. Of interest for two reasons. The first is this was the only place I saw fresh fruit sold in the City. I’m sure locals get there fix easily enough, but I wished there were more opportunities to see and buy fruits like rambutan, lychees and durian (even though it smells of poo). The second is that within Bugis ‘Food Street’ sat 2 or 3 examples of the kind of modern food entrepreneurs that Singapore will need to energise and reinvigorate its hawker scene. Lao Ban Soya bean curd. I really like this silky set dessert. I presume it’s set with rennet, or something similar, and provides a lovely cooling but not too sweet snack. More interestingly, these guys had premises at a few centres, package their product smartly and presumably have plans to go forth and multiply. Mr Q. Ordinarily I probably wouldn’t advocate a stall selling deep fried Orios and ice cream. But I loved the branding and the thought process (“I want to be in hawker centres not restaurants because it’s food to cook quickly and eat with your hands”) and the fact he’s trying to move things forward. The patron, Harry Q, said he’s fighting against traditionalists for acceptance – if it were Japan or Korea, he’d be a millionaire already. Sia Kee Teochow boneless duck. The breakdown of a whole duck and service of it along in various dishes, along with rice, soy soaked eggs, offal, beansprouts, beans and soup is absolutely mesmerising. The braised duck and the soup, in particular, are delicious. Shame everything comes covered in the same insanely sweet brown sauce. Still, a recommended meal. Lunch only. The Seafood stand. Apparently one of the best places to get crab in Singapore (whether pepper, Singapore chilli or a house special noodle dish). And one of Claus Meyer’s (the half of Noma and Nordic cuisine you don’t hear enough about) top ten street food dishes of all time – scallop with black bean sauce. Evenings only. Now this really isn’t a hawker centre. And you pay far more (but not unreasonably so) to eat in the comfortable and sanitised environment that a restaurant in a posh hotel provides. But I have to say, this all you can eat posh buffet experience served a wide range of typical Singaporean hawker food, and did so freshly and at a high quality. If the ‘experience’ of eating off plastic plates and not really knowing which stall to head to and what to order isn’t for you, this is a very good option and far better than going to a medium to high end fusion or imitation Western restaurant on one of your only nights in the city. I was a guest of YourSingapore when I visited. Hopefully this piece will be a helpful guide for places to eat hawker food if you’re visiting or live there. As a non-food aside, if you find yourself in Singapore and you’ve got no more room for food, the very new Gardens By The Bay was an impressive and unexpectedly good attraction. Worth a look-in. you did well, I’m shocked you only gained 3 kg. I’m so jealous. And I just put on 10 kilos just by looking at those photos. What fun you must have had!